Thursday night we got our first live look at the three quarterbacks competing to be the Buffalo Bills starter when the 2018 NFL season begins in a little less than four weeks. Being that I’m in Chicago and had to wait for the NFL Network replay of the Bills – Panthers game on Saturday morning, I’m a little late in getting this review to you. Briefly, I felt that the three Bills quarterbacks graded out in the same order in which they played. Nate Peterman was easily the best of the three, followed by A.J. McCarron and then rookie Josh Allen. I am not saying that Peterman was clearly the best as there were circumstances involved with each player’s grade. Peterman started the game and played very well. He finished his small amount of playing time by completing 9 of 10 throws for 119 yards, one touchdown and one interception. The interception came on a dropped pass by his receiver not a poor throw. What I liked about Peterman was he was decisive with his reads and decision making and got the ball out of his hand quickly. He didn’t force and throws and his accuracy and ball placement were outstanding. Really, looking back at his play and there was nothing to criticize. The fact that he played with the starters helped in that he had the best personnel groupings surrounding him. The other thing that I liked about his play is that he played within himself. He didn’t force anything nor did he try to make a throw that he wasn’t comfortable making. If he plays like that in all the preseason games, he will most likely be the starter for week one of the regular season. McCarron followed Peterman in the quarterback rotation and also played well but I felt that his overall play wasn’t quite as good as Peterman. Granted, he played with the two’s and if the roles were reversed we could argue that he may have played even better had he played with the one’s. McCarron also put up good numbers completing 7 of 10 throws for 116 yards. What jumped out at me though was he wasn’t quite as decisive as Peterman was with both his decision making and delivery quickness. Yes, playing with the two’s could have had something to do with that. Still he made some very nice throws and even more important, he put 10 points on the board for the Bills when he was in the game. The bottom line is if McCarron keeps playing this well for the rest of the preseason, the Bills will have a tough decision to make as far as who will be the opening day starter. Allen got to play the entire second half and did some nice things. Yes, he looked like a rookie at times but he also made some very good throws. For the most part he showed good poise and his overall decision making was fairly good. For the night he was 9 of 19 for 116 yards and one touchdown. He did not throw an interception. One thing stuck out and that is the arm strength of Allen. He probably has one of the strongest arms in the entire league. His mechanics were fairly good, showing a quick tight delivery and fairly good accuracy. I say fairly good accuracy because there were a few throws that weren’t close and that can be concerning as accuracy was his problem while in college. When someone has an arm like Allen, we want his deep ball accuracy to be good. Thursday night that part of his game was very average. In fairness to Allen, he played with the three’s and what we don’t know is if all his off-target throws were his fault or the receivers. The coaches will know the answer to that when doing their tape review. What we want to see from Allen in game two is a little better decision making and better accuracy. If he improves from week to week that is a good sign that he is taking coaching well and trying to improve on mistakes. 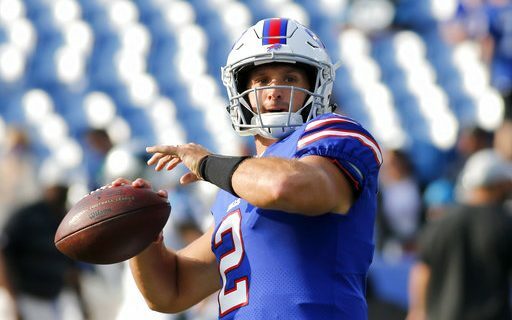 Going forward it wouldn’t surprise me if the Bills switch up the rotation this week with McCarron starting and Peterman entering the game as the second quarterback. That way each quarterback gets an opportunity with the one’s before the all-important third preseason game. If that isn’t the case, then it may be a sign that the Bills coaches and decision makers have already made up their mind that Nate Peterman will be the opening day starter. As for Allen, I still feel it is best for him to sit and watch as a rookie unless he clearly shows he is the best quarterback on the Bills roster. In my opinion, he hasn’t shown that yet.